I had so much fun styling this pop at West Elm Chicago for Tania Rodamilans' jewelry collection! It would be very difficult to style a table poorly in West Elm's design heaven, but I'm sharing a few of my favorite ways to style a pop-up that is recognizable to your brand. This includes colors, patterns, materials, objects, symbols, etc. Only commit to 2-3 so that it's easier to be known for a specific combination of elements. Nerdy tip: Think of H2O. You can't have water without oxygen. You can't have your brand experience if you don't have blank + blank + blank. How will you stand out from others if you're only catering to one level of sight. Our eyes love traveling from one line to the other. It's more interesting and offers options for viewing your products. It also provides balance to a curated table. Some products are featured better hanging vs. laying down or in a package. Think "how will my customer quickly envision it for their use?" and "is it too difficult to see what the product is?". Also, if your product is a lighter color or delicate, consider featuring it on a dark or contrasting background so that it doesn't get lost. It's great to have options, but have 60% of your pop-up table or space be simple and decluttered. You want to give your customer a stress-free and clear understanding of your brand and product. If you have too many collections, types of products or mediums you make it harder for your customer to remember you and share your brand. Pick 1 medium and a maximum of 2-3 collections that you want to be known for. Knowing your customer and the experience they love will inspire you to tweak your pop-up for their interest. Remember that you can not appeal to everyone. I recommend focusing on 2 target customers when considering your product development and experience styling. People buy more when they fall in love with the story behind a product. Having fun and making friends is the easiest cheapest way to give a quality brand experience! Mingling with Hudson Smith Designs and Tania Rodamilans at West Elm Lincoln Park. Interested in styling your own pop-up? Comment below if you have any questions or want to hire a stylist for your next event! 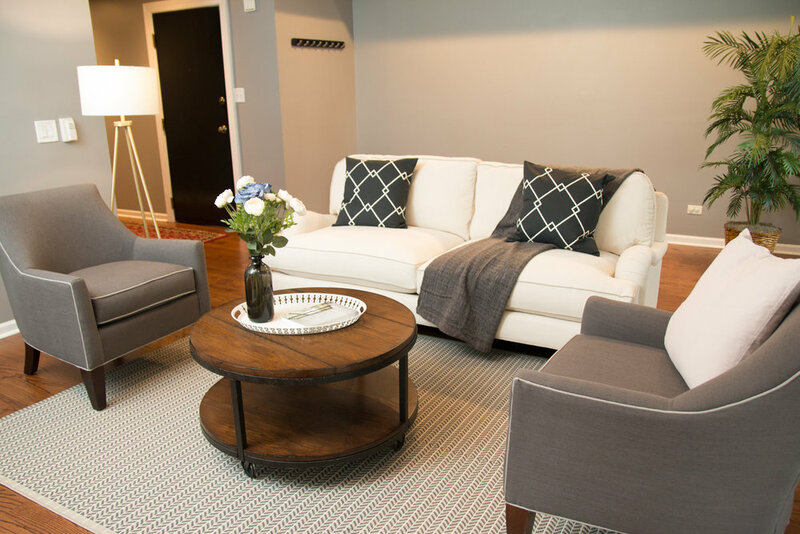 Chicago Home Staged: Sold 4 days on the market! Since a tween I was constantly tweaking, organizing and styling my spaces for comfort and inspiration. Style and creativity gave me a sense of stability and a retreat. Growing up in a chaotic environment I found every way to control my environment by tweaking what I had. I once made a side table for my books out of a cardboard box and wrapping paper. From scents, music, colors and art I knew that by tweaking my environmental experiences I could make the most of a bad home life. Style for Less: I get a thrill out of making something beautiful from what many think is nothing. I find most of my pieces at thrift stores like the Brown Elephant and online discount sites like Wayfair and Amazon. My savvy skills have allowed me to work with a variety of client budgets and help more people who are in major need of home inspiration. I believe that anyone can have their dream space now by adding a few personalized pieces with what they currently have. "Small style tweaks really make a huge difference in our spaces." As a business owner my home and my work space continue to be super important to my productivity and creativity. As I grow, my style continues to grow with me. 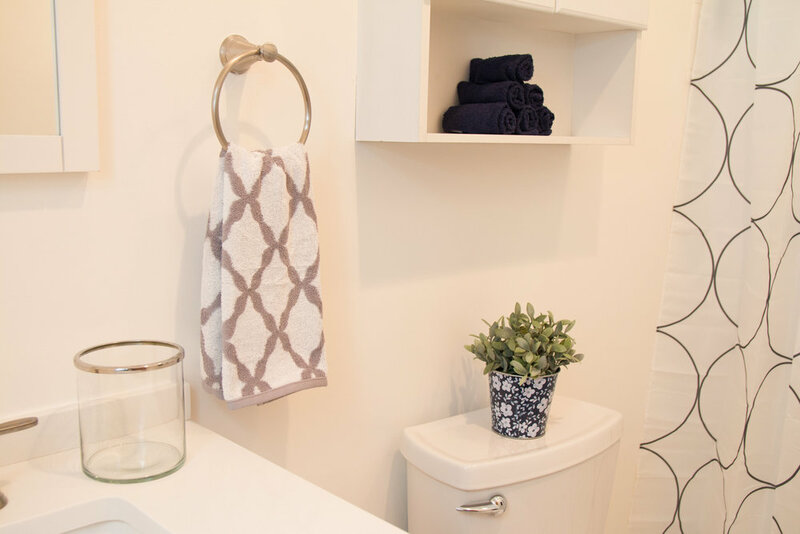 I can't wait to see what my next home tour style will be! My Style: I love mixing styles in a smart balanced way. Every time I style a room I let my intuition lead. A lot of my personal style inspirations come from my passion for light and airy spaces that feel almost heavenly. The world is such a chaotic tough place so I wanted my home to feel peaceful and light. My home has a mix of modern edgy, feminine and a touch of California style. You'll also see a lot of texture in my apartment because it is my favorite way to style any space. It's amazing how an added dimension like a weaved pattern, leather fringe or a three-dimensional painting can really add warmth. The desire to "touch" items with texture in a space can create a more intimate experience. I always have fresh flowers around as a reminder of growing up in beautiful New England. Favorite Items: It's so hard to pick my favorite because I put careful thought and passion into every piece. If I had to pick one I would definitely say my new fringe belt. It's amazingly beautiful laid over a chair or as wall art. The other items I absolutely love in my apartment would be my vintage pharmacy lamps I found at a thrift store and my personally painted art pieces. The lamps and art really make statements in my main living space. Next Home Project: I can never wait to start my next project! I've been planning out my coffee/cocktail bar for months. I work from home sometimes with my team and entertain friends often. 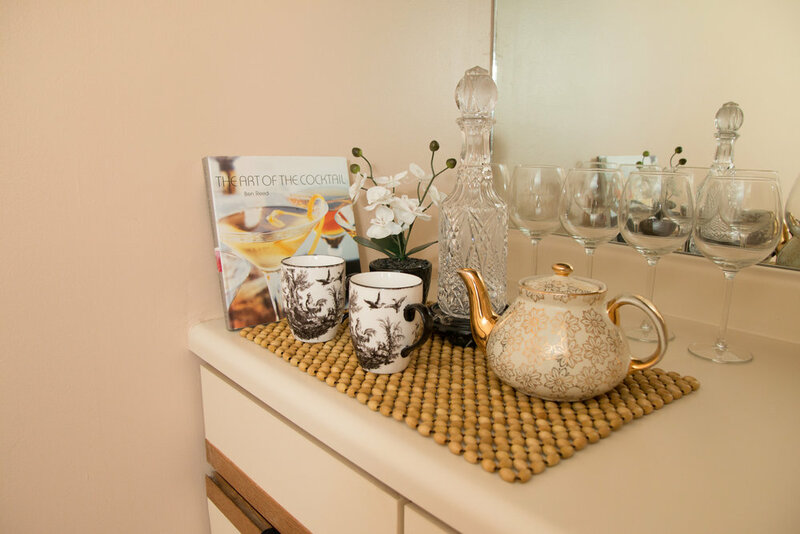 I want my guests to have a space they know to help themselves to drinks and snacks. Thank you for visiting my home! I hope you come back and visit again and share with your friends. Would love to hear your comments, questions or learn about your own home style below! Photography by Matthew Weiss of Soul and Structure.